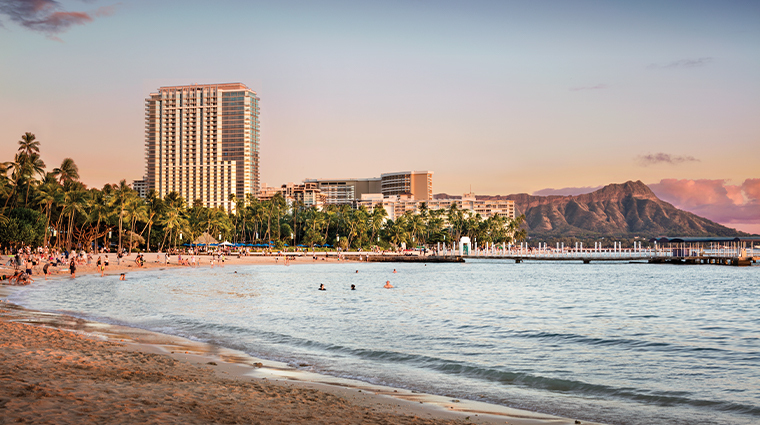 Treat your brood to an unforgettable island escape this holiday season when you book The Ultimate Family Hawaiian Getaway from Forbes Travel Guide Five-Star Trump International Hotel Waikiki. Enjoy up to 35 percent off the resort’s residential-style suites or penthouses (equipped with luxurious marble bathrooms, Sub-Zero kitchen appliances and plenty of elbow room) and a $300 resort credit to use however you choose — the breakfast buffet at In-Yo Café is always a crowd-pleaser. Fourteen-day cancellation required. Blackout dates may apply. Since Trump International Hotel Waikiki opened in 2009, it has been all about the details at this 300-room luxe property on the edge of Waikiki. The well-designed rooms and suites boast Italian marble bathrooms, deep soaking tubs, gourmet kitchen appliances by Sub-Zero and Wolf, rich leathers and rare exotic woods. The hotel offers its signature VIP service, Trump Attaché, an on-call personal assistant who can help with everything from stocking your kitchen with your favorite snacks to offering suggestions for restaurants and activities. You can hire an in-room personal chef or personal trainer. And you have all of the hotel’s top-notch amenities — from the world-class spa to the sixth-floor infinity pool — at your disposal. Trump International Hotel Waikiki sits on prime real estate in Waikiki on Oahu, literally steps from the beach but just outside the frenetic pace of Kalakaua Avenue. Just steps from Oahu’s most famous strip of sand, Trump International Hotel Waikiki offers a spa that blends the signature luxury of the Trump brand with authentic Hawaiian healing. Don’t lift a finger while you’re relaxing by the pool. Poolside food and beverage service is offered from 8 a.m. through 6 p.m. featuring bento-box lunch creations and a lineup of handcrafted cocktails. Available to any guest of this Five-Star hotel, the Trump Attaché offers everything from personal and business assistance to custom-stocked kitchens and personalized business cards and stationary. Kid-friendly amenities abound at this Waikiki hotel, like kiddie cocktails, coloring books and no-tear bath amenities are just the beginning. Peak seasons for travelers to Oahu and the hotel are summer and winter, and room rates will reflect the demand. You will likely get lower prices during spring and fall. In addition to luxurious treatments, you can opt to book a yoga class at the Waikiki hotel’s spa. Enjoy a morning smoothie along with your sun salutations on the beautiful Ivanka Terrace. Complimentary pre-packed beach bags are available at the concierge desk to make your vacation even easier. Pick up your pack filled with towels, sunscreen and fresh fruit. The Waikiki hotel’s spacious guest rooms, complete with fully-equipped kitchenettes, are ideally suited for couples and friends seeking the ultimate Hawaiian experience or a romantic getaway. 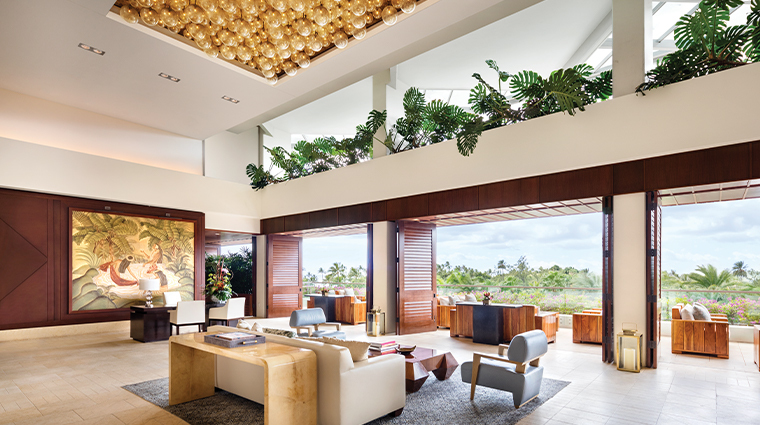 Residential-style suites are appointed with fully-equipped kitchens and top-of-the-line appliances by Wolf, Sub-Zero and Bosch, making it simple to whip up a family breakfast, or have a romantic dinner cooked in-suite by a Trump Hotel Waikiki chef. Luxurious touches include Italian marble bathrooms with deep soaking tubs and a washlet, floor-to-ceiling windows, a 42” flat screen HDTV, a Sony radio with an iPod docking station and a DVD player. Trump International Hotel Waikiki’s signature restaurant — and the one that lures non-guests, too — is BLT Steak, a contemporary American steakhouse with locations in cities including New York, Atlanta, Miami and Hong Kong. It combines a bistro ambience with steakhouse fare and an impeccable French technique, with a menu featuring prime cuts of beef, fresh seafood and seasonal desserts. Every night the restaurant serves freshly caught local seafood such as ono (wahoo) and Keahole lobster prepared in a variety of ways. The hotel’s sixth-floor In-Yo Café offers an international breakfast buffet every morning, with made-to-order omelets and signature dishes such as cinnamon roll French toast with toasted macadamia nuts and a Kona coffee anglaise, and malted waffles topped with strawberries grown in Kula, Maui.